Cooking with matcha green tea powder is one of the easiest and tastiest ways to incorporate tea into your food. 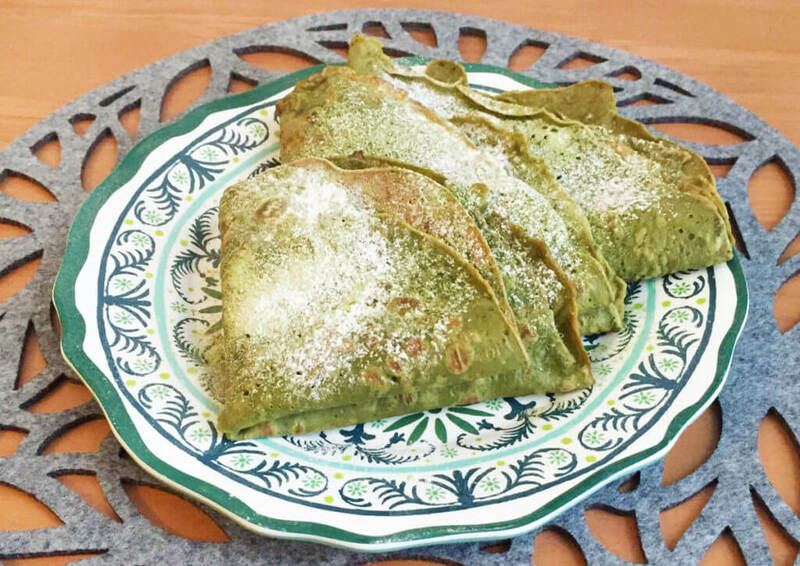 Green tea can now be a part of your favorite breakfast with this delicious matcha crêpe recipe. Don’t be intimidated if you have or haven’t tried to cook or bake with tea before; matcha is a little different. Other teas impart their flavor by steeping, with you ultimately discarding the leaves. For many baking and cooking recipes involving tea, this means infusing something liquid with steeped tea; getting the flavor and proportions just right can be tricky. The good news is that matcha comes in powder form, so it can be incorporated into a recipe with the dry ingredients, no steeping required. Mix it into frostings alongside powdered sugar, or mix it in to cakes and pancakes alongside the flour. Just think of it as a dry ingredient like baking soda and you’ll be a matcha baker in no time! The other great part about matcha is that it has a kick of caffeine without the coffee jitters. This makes it a suitable choice to add to breakfast foods and to power up afternoon smoothies. Not to mention matcha has other added health benefits, like a boost of antioxidants and minerals. 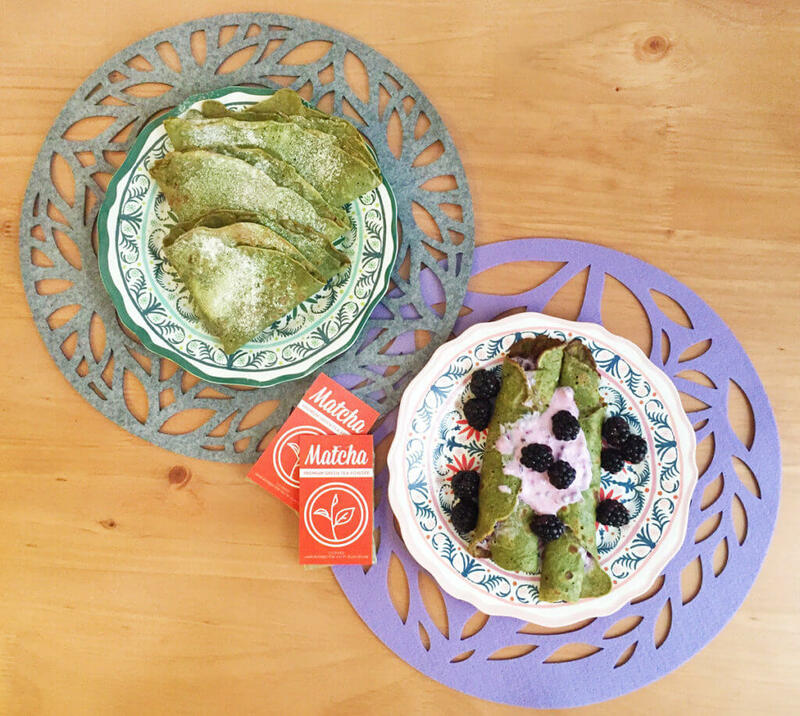 In case cooking with matcha wasn’t easy enough, our Plum Deluxe matcha powders have added flavors already mixed in. You can use these fun flavors to your advantage to give your food an extra pop of fruit or sweetness. Even unflavored matcha has its own character, ranging from flowers to vanilla to grass or even seaweed. 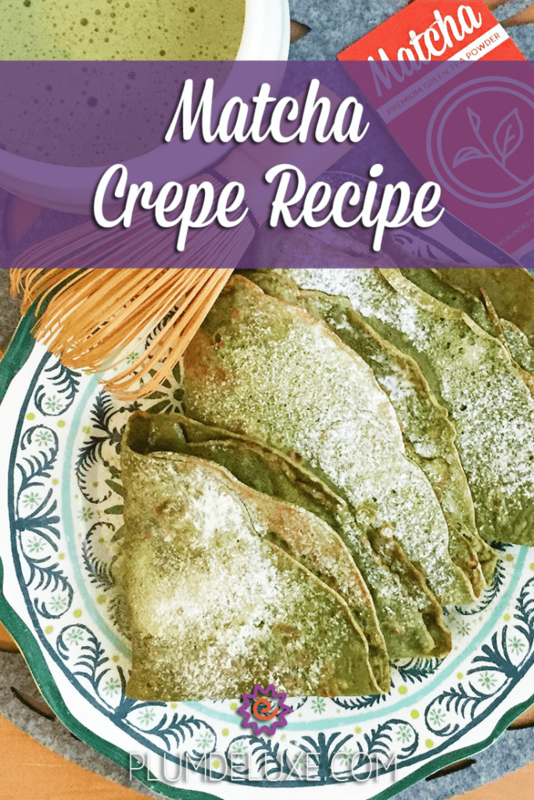 When working with this matcha crêpe recipe, try to pair the right flavor of matcha with the right toppings. For example, pair a naturally floral matcha with honey, a more vegetal matcha with savory cheese and spinach, or a nutty matcha with chocolate or hazelnut spread. Crêpes are one of those lucky foods that can go either way — as sugary as a dessert, as savory as a meal, and all combinations of sweet and spicy in between. Don’t be afraid to mix and match your flavors and add-ins. Some classic choices in my family are crêpes sprinkled with cinnamon sugar and a dollop of jam, or drizzled with maple syrup and wrapped around a slice of crispy bacon. 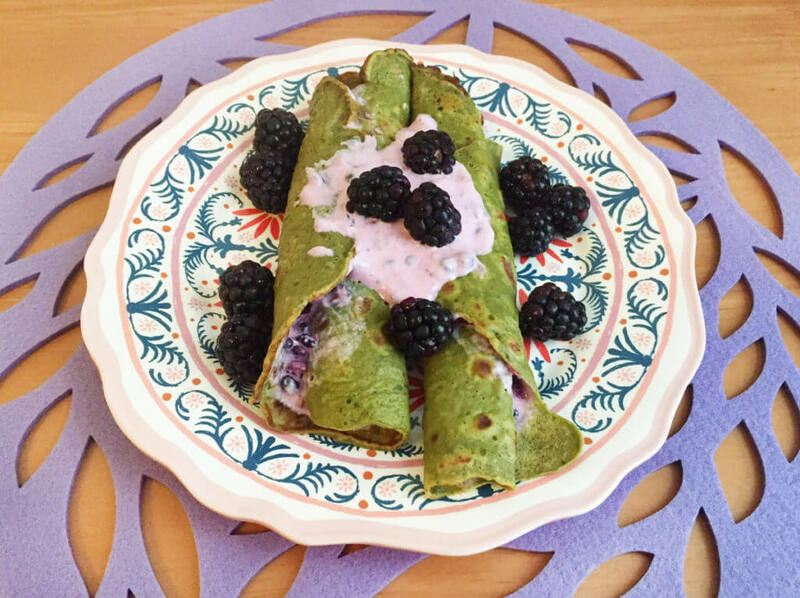 I topped the results of my matcha crêpe recipe with blackberries and yogurt and classic powdered sugar. Mix together eggs, milk, sugar, and salt until well combined. Sift flour and matcha into wet ingredients. Sifting helps avoid chunks of dry ingredients and makes for a smoother batter. Whisk together well. Batter should be smooth and thin. If too thick, add a little more milk. Chill batter in fridge until ready to cook. (Can be saved overnight). Heat pan on stovetop. When hot, add dab of butter and melt. With a ladle or or measuring cup, pour about 1/2 cup of batter into pan. Immediately tilt pan to thinly disperse batter in pan. Cook until edges are dry and begin to crisp. Center should have some small popped bubbles. Using a spatula, make sure edges aren’t stuck and carefully flip crêpe. Cook second side for about 30 seconds, then transfer to plate. Repeat with remaining batter, adding butter as needed. If you got a kick out of these crêpes, next time you can adapt some of these creative crepe recipes for even more flavor combinations. Or, if you can’t get enough green tea, check out this matcha iced tea recipe to enjoy an extra boost to your breakfast.